Reservation from created after my husband left the sales office at 10:30. This form has been created at 11:16 whilst my husband was at work. Reservation from created after my husband left the sales office at 10:30. This form has been created at 11:16 whilst my husband was at work. Bottom section close up. However, due to lack of evidence that Keepmoat did this with the intent of receiving financial gain the Police have closed the investigation. Funny how Tom Fenton, Peter Hindley and Mark Knight didn’t even believe that Keepmoat had committed forgery. 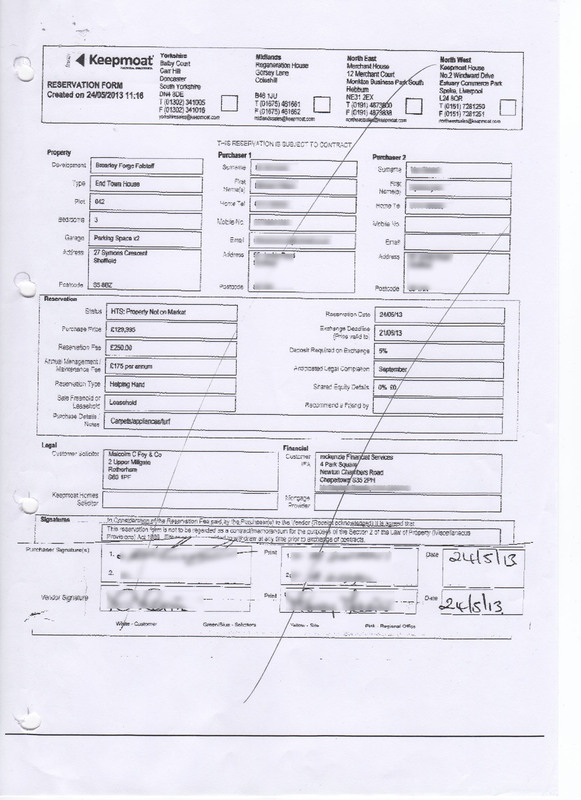 This entry was posted in Uncategorized and tagged keepmoat forgery on 26 July, 2015 by admin. I am trying to get our early bird fee back after 2 months and no one responds to my emails or phone calls! The have absolutely no customer service. I will be going down to the sales office and not leaving till I get it back!